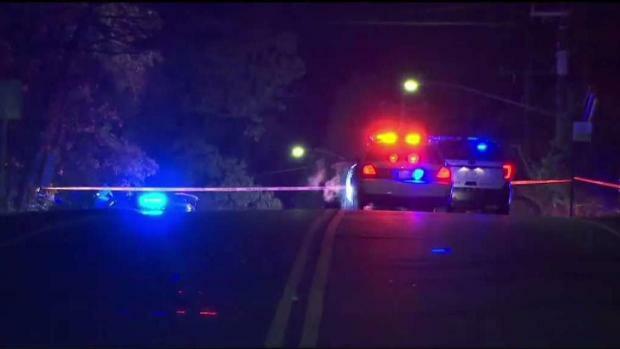 A 25-year-old man who was fatally shot by U.S. Park Police after a police chase drove away three times from the officers who tried to stop him, dashcam footage from Fairfax County police showed. 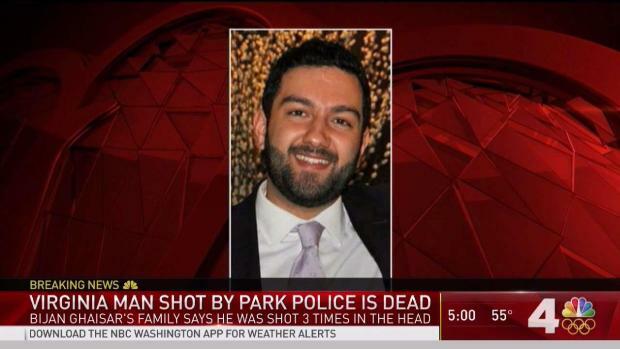 Bijan Ghaisar, 25, of McLean, Virginia, was shot by U.S. Park Police on Nov. 17, 2017, after he was suspected in a hit-and-run. He died 10 days later. 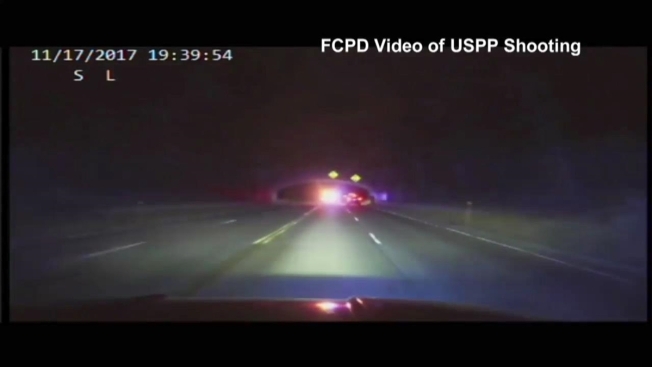 Footage of the shooting was captured on a dashcam inside a Fairfax County police cruiser. “Utterly reckless, uncalled for and not one moment was there any protocols of de-escalation,” said Tom Connolly, attorney for Ghaisar’s family. The police department released the video Wednesday morning. "The video does not provide all the answers. However, we should all have confidence in the FBI’s investigation of this matter, as I know it will be thorough, objective and professional," Fairfax County police Chief Ed Roessler said in a statement. In the video, an armed Park Police officer can be seen banging on the window of Ghaisar's vehicle. It's not clear if orders are being given, but after a moment, Ghaisar drives away. Park Police, along with two Fairfax County police officers, continue to pursue Ghaisar. The officers corner Ghaisar once again, but he pulls away, continuing to evade them. After a brief drive, Ghaisar stops at a stop sign, and a police cruiser pulls in front of him, blocking his way. As he tries to pull away again, the officers fire multiple shots. Ghaisar's SUV pulls forward slightly, more shots are fired and the vehicle crashes into a ditch. 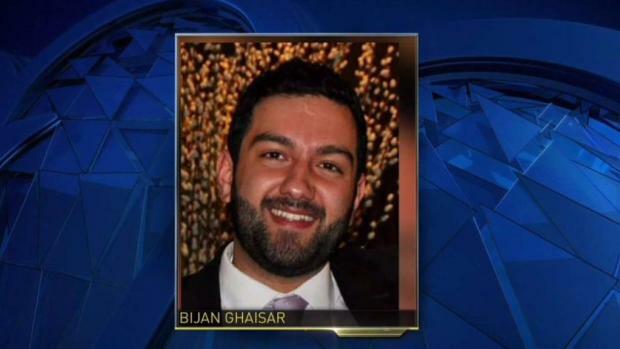 "Bijan Ghaisar was repeatedly threatened by over-aggressive and out-of-control law enforcement officers, after he drove away from a minor traffic incident, in which he was the victim and in which there was little property damage and no known injuries," the Ghaisar family said in a statement Wednesday. Ghaisar, the only person in the SUV, was taken to a hospital in critical condition. After 10 days, he died of his injuries. Connolly said the family has watched the video. "I don't know that any mother or any father or any sister could look at a video in real time and see their loved one be executed in the way that happened here and not be devastated," he said. Park Police pursued Ghaisar's SUV after a hit-and-run was reported on the GW Parkway in Alexandria, the agency said in a statement. 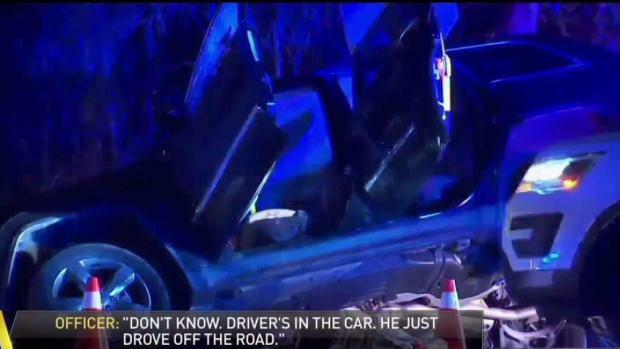 According to the crash report, Ghaisar's SUV was rear-ended about 7:30 p.m., when he suddenly stopped in the left lane, the driver and passenger in the striking vehicle told police. 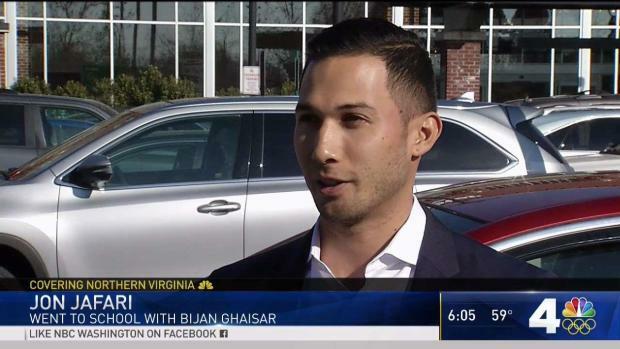 News4's David Culver spoke with a friend of Bijan Ghaisar, the 25-year-old who U.S. Park Police shot and killed earlier this month. Ghaisar drove away, and about five minutes later, Park Police reported being in pursuit. The driver of the car that struck Ghaisar from behind was cited for failing to maintain proper control, according to the crash report. “While respecting the integrity of the investigation, I also recognize the desire for more information and details surrounding the investigation," U.S. Park Police Chief Robert MacLean said in a statement. The officers involved in the shooting are on administrative leave. The FBI, which took the lead in the investigation, previously said they would not provide additional information because a federal investigation is ongoing. The FBI did not say why Park Police opened fire. Also, they did not comment on whether Ghaisar was armed. It remains unclear why police used deadly force. "If not for the Fairfax County Police Department dashboard camera, the world would not have seen the disturbing behavior by two U.S. Park Police officers that led to the horrific shooting of Bijan Ghaisar on a Friday night last November,” Roy L. Austin, attorney for the Ghaisar family, said in a statement Friday. “The Ghaisar family is committed to ensuring justice is served in the senseless killing of their son and brother, who was shot 5 times at close range by these Park Police officers. The family shares Rep. Eleanor Holmes Norton's views that uniformed federal law enforcement should be required to wear body cameras and have dashboard cameras in their vehicles, and looks forward to doing whatever is necessary to make sure that becomes the law of the land," Austin said. Sens. Tim Kaine and Mark Warner released statements saying their staffs have met with Ghaisar's family. Both said they will follow up with the FBI on the investigation. "Bijan’s family deserves full transparency and answers to their outstanding questions about the death of their son," Kaine said. "I believe they deserve answers about the circumstances under which U.S. Park Police Officers engaged with Mr. Ghaisar during this incident, including repeatedly firing into his vehicle and ending his life," Warner said. The family filed notice with the federal government they intend to file a civil lawsuit, giving the government six months to settle out of court or respond another way. The family plans to hold a vigil outside the Department of the Interior, which oversees Park Police, Friday evening. Roessler and Fairfax County Board of Supervisors Chair Sharon Bulova had each called on the FBI to release the video as quickly as possible. Fairfax County officials were criticized for their lack of transparency after the Aug. 2013 police shooting of John Geer.